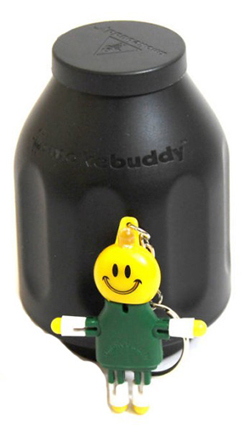 The “Smoke Buddy” is an air filtration system that you exhale into and out the other end no smoke or vapor appears, and no smell. Very handy to have around and good for in the house use. Simply exhale into the smoke buddy and watch how there is NO Smoke or Vapor coming our the other end. The Smoke Buddy lasts up to 2 months (based on our review and testing) and the 2 caps keep the odors in. This product is simply amazing and a must for any closet smoker or vaporist. Countdown to 420. Are You Ready?